We launched our website last year, on the date of Shakespeare’s 400th anniversary, with an introduction to the project and something of a provocation in Andy’s post about putting the Shhhh into Shakespeare…. The comments that followed have been matched by recent posts that have engendered debate and discussion amongst readers, including the creation by Elizabeth Tavares of an open-group bibliography on authorship and collaboration. It’s exciting to see the website prompting engagement and opinion both at its birth and here at its anniversary. More of the same, please! Our project’s timeliness—not least in asking questions about playing spaces, evidence, and narratives at the same time that Museum of London Archaeology’s dig at the Curtain theatre caused something of a tremor in the early modern community—elicited our first guest post from Liz Oakley-Brown on earthquakes. Since then, we have been pleased to welcome other guest posts, including Tom Rutter’s piece on the Admiral’s Men a couple of months ago, which marked the launch of his book on the subject. We’ve also hosted some thoughts from Roehampton PhD researcher Kim Gilchrist, who audited our first Advisory Board meeting (briefly written up here). Before Shakespeare is eager to hear from a range of voices on the blog—and not just academics!—and the first year has begun to showcase the benefits of diversifying discussion. Actor Adam Cunis offered some thoughts on performance last year, and we hope to complement Adam’s blog with subsequent pieces by actors involved with our workshops, and beyond (and see our Galatea workshops, below). Both Tom Rutter and Adam Cunis offer ways of thinking about repertory from different historical and performance perspectives. Most recently, we’re honoured that Sally-Beth MacLean used our blog to announce the launch of Records of Early English Drama online—a new resource for early modern historians—with some thoughts on its Before Shakespeare material. We were very pleased in January to host the first of our workshops with James Wallace and The Dolphin’s Back—a sell-out event on the site of the former Red Lion playhouse in Mile End, on The Three Ladies of London. A reflection on that workshop with photos is the subject of a post from the beginning of this year. In August last year, we worked with Emma Frankland to workshop John Lyly’s Galatea (thanks in part to the generous support of Shakespeare Bulletin) with a diversity-positive cast, especially in relation to gender, transgender identity, race, and disability. The experience of translating the play into British Sign Language and working across languages; of the challenges and pleasures of working with what might be termed a “classical” play, though one that is non-canonical; and of the playtext’s and the room’s discussion of gender and racial identity made for a week of electrifying workshops. These are all recorded on the Galatea section of our blog, featuring interviews with actors, images, videos, links, and write-ups. The workshops also saw songs and dances from the play staged with deaf and hearing actors, to original music by Victoria Abbott; these are featured on our YouTube page. During this week, we were working with a non-traditional approach to performance, but we welcomed academics into the room in an open manner for mutual exchange and participation; we eagerly welcomed the Lyly and textual scholar Leah Scragg into the workshop and benefitted from her response to seeing the play work with BSL performers. This fluid approach to performance and scholarship was recorded in a blog from Stephen Purcell, a response from Hester Bradley, and a photo-blog from Liz Oakley-Brown. We’ve hosted a number of blogs touching on the project’s research in posts that relate to Sally-Beth MacLean’s exploration of the presentation and reading of evidence. The Before Shakespeare website was visited by early modern concerns about haunting playhouses (posted a little early for Halloween). The fluid approach to performance and scholarship that defines our work with Galatea is matched in our showcasing of research-in-progress in the archives; a blog offering some early thoughts on the archives raises some initial ideas about the City’s relationship to theatre springing from work at the London Metropolitan Archives. Lately, these research-focussed blogs have showcased two installments of “Post from the Past”: blogs that centre on a single letter as an insight into Elizabethan London. The first treats Elizabethan espionage and one of Francis Walsingham’s spy’s opinions about the playhouses. The second introduces a week in the life of the City’s Recorder, William Fleetwood, and details a particularly riotous few days for the city, starring a bolshy Burbage. Our popular Guide to the Elizabethan East End looks at the area that was home to the Red Lion playhouse, offering advice on the location’s hot property and the low-down for those interested in moving to sixteenth-century Stepney… The post coincided with our workshop with James at that very location, so none of the attendees had trouble navigating their way there. Some topical posts have featured crossovers between old Elizabethan and new Elizabethan concerns: a post from July in the wake of Brexit reads the North/South divide through a pamphlet of 1579 interested in playhouses and recreational space; the closure of Fabric prompted a piece on the policing of youth culture, now and then; and a budget announcement in November of last year offered a chance to explore rental control and the representation of landlords (feat. a visitation from Richard Tarlton). Topicality has also marked the past month of the blog, where two posts have generated a healthy amount of interaction (as mentioned above): Andy’s discussion of a furry gathering, which neighboured the Shakespeare Association of America in Atlanta, and navigating issues of difference, play, fantasy, and normativity, caught the attention of shakeass-ers and furries alike. Another recent post on attribution and attrition elicited an extended (and ongoing) discussion in the comment section. We’re hopeful of encouraging further talkback and rigorous debate (as well as general comments and thoughts) and encourage readers to engage with posts on the blog and perhaps even write their own. (If you’re interested in contributing, please contact beforeshakespeare@gmail.com.) We look forward to another year of activity and to sharing our work with wider audiences here on the website. Please keep an eye on our events page, on our conference on 24-27 August 2017, and on future announcements. In the meantime, we want to say thank you to our visitors—those who have tasted, others who have swallowed, and those few who have chewed and digested (to paraphrase Francis Bacon)—and to welcome new readers. Happy Birthday to Shakespeare (we can do it too! 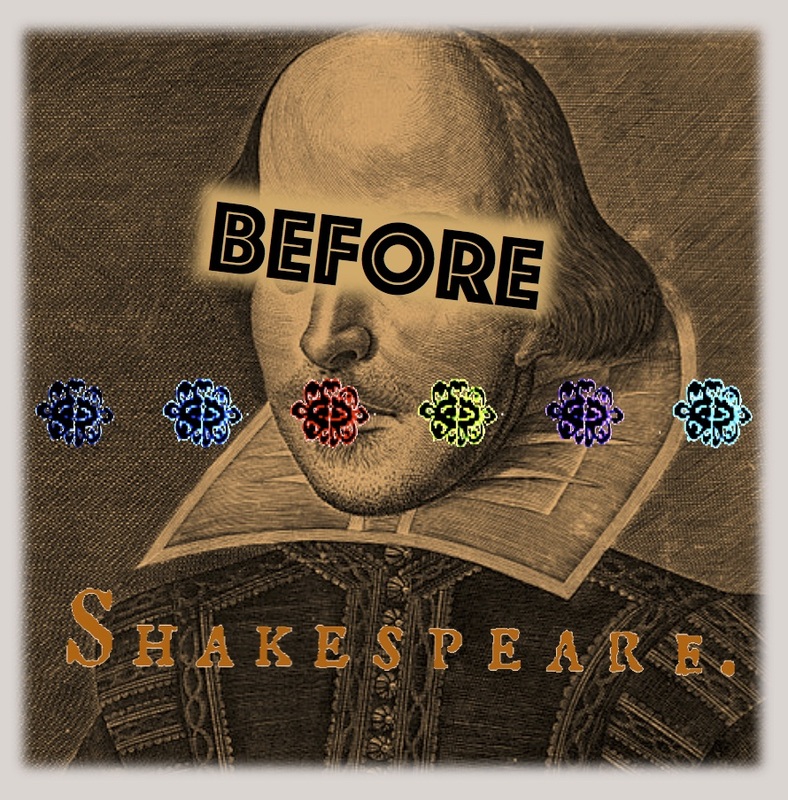 ), and to Before Shakespeare! Thanks for this great roundup, Callan. I’m looking forward to seeing what discoveries you make in the archives in the next year. It’s also important to revisit the available evidence from new perspectives and I’ve really appreciated the work you’ve done in that respect too. Happy birthday Before Shakespeare!